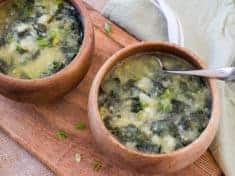 Rich with potato chunks, tender white beans, tomatoes, and dark green shredded kale–kale and potato soup and all its interpretations are known as caldo verde in Europe’s westernmost country. 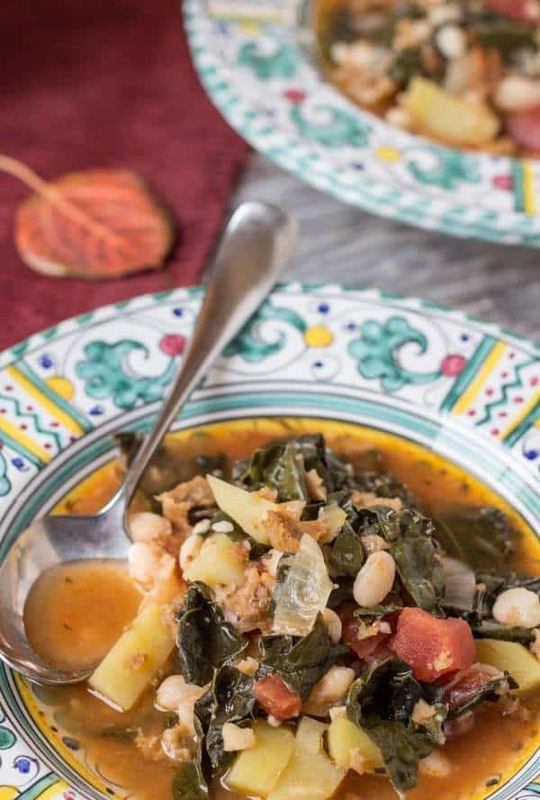 Like Tuscan minestrone or Russian borscht, Portuguese kale and potato soup ingredients vary according to the cook—one family’s soup is likely different than the neighbors’. No matter the recipe, this soup is a natural for speedy cooking the Instant Pot pressure cooker. Spring forward, fall back. How many of us rely on the little ditty to remember which way to turn the clocks? Every spring we lose an hour, every fall we gain it back. Did we really gain an hour last week? No, the sun just sets earlier. Huh? For the record, I think daylight savings time is awesome, it’s just that every fall, there’s the getting used to earlier darkness. What to do? 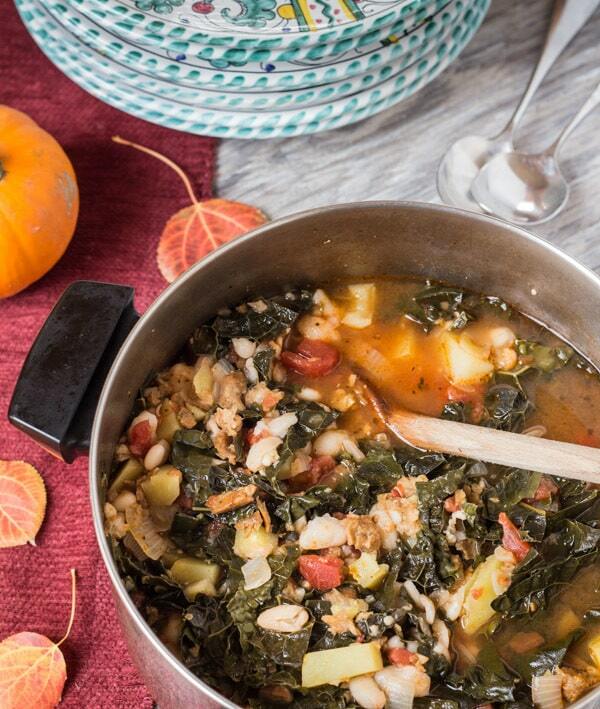 Make vegetarian Portuguese kale and potato soup. Guaranteed, a hearty soup dinner will warm these darkening days. As a meatless cook, I’m slow to tell you that caldo verde traditionally includes mildly spiced chorizo sausage. Hearty soup loaded with kale, potatoes, and beans, to be stellar, certainly doesn’t need meat, but I wanted to keep the spicy sausage flavor and chewy texture you get with cooked chorizo. Times like these, I shop in the parallel aisle, and swap in a vegan meat alternative. 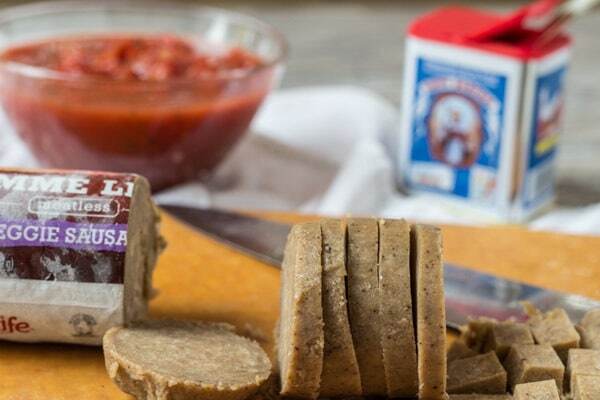 Yeah–people have their opinions about vegetarians eating fake meat, just as they do about daylight savings time. Serve this rendition of the classic Portuguese kale and potato soup to meat lovers and vegetarians alike—they’ll be thrilled. Enough to forget how early it got dark! For timesaving ease, I make all my soups in a pressure cooker. With a pressure cooker, this soup is on the table in 30 minutes, start to finish, no exaggeration. The cooked beans and browned soysage crumbles go in after the pressure comes down. 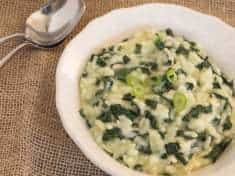 Inspiration for this interpretation of Portuguese kale and potato soup comes from Twelve Months of Monastery Soups by Brother Victor D’Avila Latourrette. 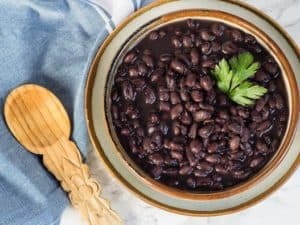 Brother Victor uses dried white beans and simmers the soup two hours. 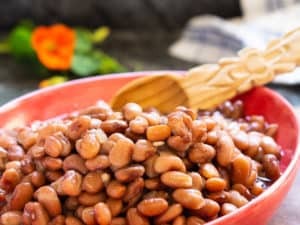 This recipe uses already cooked white beans. 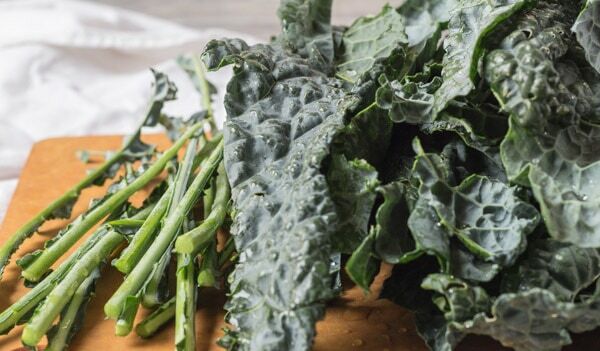 With a pressure cooker, once the pressure is up, the potatoes, tomatoes and kale cook in 5 minutes. Stovetop, without a pressure cooker, count on 45 minutes of cooking. Each month, Becky of Vintage Mixer orchestrates an #eatseasonal recipe roundup featuring produce listed in her seasonal food guide. This soup is part of November’s roundup. For more seasonal inspiration, peruse the chart with the cabbage print, and then follow the links to more seasonal recipes. Celebrate November’s bounty—cook something delicious! 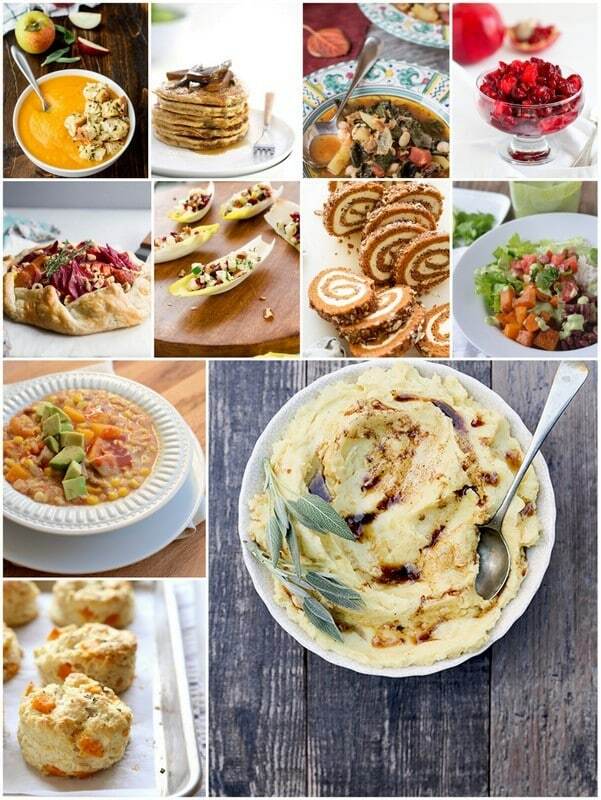 Check out recipes I save from all over the web on Pinterest. ** This recipe is an update of the soup I posted in October 2009, on my old muffintalk.wordpress.com blog. No photos back then. 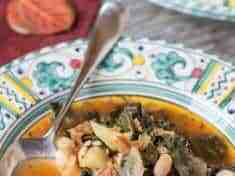 You will love this soup, and like me, make it for years and years! 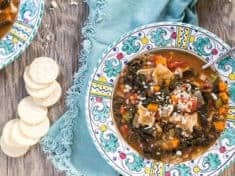 Loaded with potatoes, kale, potatoes and white beans, and faux sausage, this spicy soup is almost a stew. Made in the Instant Pot or pressure cooker, it will be on the table in 30 minutes--no exaggeration! Sauté the onions and garlic in the pressure cooker until the onions are translucent, about 10 mintues. Add the water, tomatoes, potatoes, and kale, lock the lid in place and cook on high pressure 5 minutes. Quick release the pressure. Alternatively, heat the first tablespoon of oil in a soup pot. Over medium flame, sauté the onions until translucent, about 10 minutes. Stir in the garlic and cook a few more minutes. Add the water, tomatoes, potatoes, and kale. Cover and simmer until the potatoes are tender, about 45 minutes. While the soup cooks, heat the remaining oil in a wide (preferably non-stick skillet.) 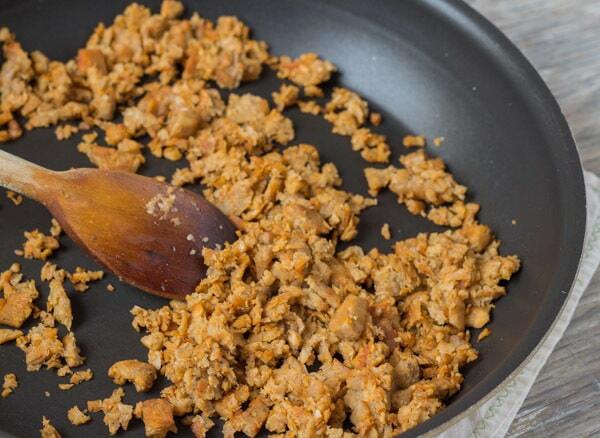 Using a wooden spoon to smash the pieces, cook the veggie sausage with smoked paprika until nicely browned. When the potatoes are done, add the beans, faux sausage, vinegar and salt. Generously grind in black pepper, like 30 grinds. Taste, and add more salt, if needed. Cook a few more minutes, until the beans are heated through. With a pressure cooker, this soup is on the table in 30 minutes, start to finish, no exaggeration. The cooked beans and browned soysage crumbles go in after the pressure comes down. You can use Italian-style tomatoes seasoned with onion, garlic and oregano. Diced tomatoes are fine as well.